Asynchronous Transfer Mode (ATM) and Synchronous Optical Network (SONET) together provide the capability for a telco to provide high-speed services for both voice and data over the same network. SONET defines a method for transmitting digital data at high speeds over optical cabling, and ATM defines how to frame the traffic, how to address the traffic so that DTE devices can communicate, and how to provide error detection. 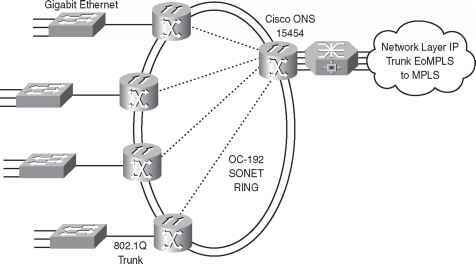 In short, SONET provides Layer 1 features, and ATM provides Layer 2 features over SONET. This short section introduces you to the basic concepts. Synchronous Optical Network (SONET) defines an alternative Layer 1 signaling and encoding mechanism, as compared with the line types listed in Table 4-4. The motivation behind SONET was to allow the phone companies of the world to connect their COs with high-speed optical links. SONET provides the Layer 1 details of how to pass high-speed data over optical links. Optical cabling has fiberglass in the middle, with a light signal being sent over the fiberglass. Optical cabling is more expensive than copper wire cables, and the devices that generate the light that crosses the cables are also more expensive—but they allow very high speeds. During the same time frame of the development of SONET, the telcos of the world wanted a new protocol to support data and voice over the same core infrastructure. SONET was built to provide the Layer 1 high-speed links, and ATM was created to provide the capability to mix the voice and data. Both voice and data traffic could be broken into cells; by using small ATM cells, the delay-sensitive voice traffic could be interleaved with the data traffic, without letting any congestion caused by the bursty nature of data get in the way of high-quality voice. Outside the United States, the term Synchronous Digital Hierarchy (SDH) represents the same standards as SONET. Also, the term optical carrier (OC) represents the prefix in the names for SONET links that use a variety of different link speeds. Table 4-8 lists the different speeds supported by SONET. Asynchronous Transfer Mode (ATM) provides data link layer services that run over SONET Layer 1 links. ATM has a wide variety of applications, but its use as a WAN technology has many similarities to Frame Relay. When using ATM, routers connect to an ATM service via an access link to an ATM switch inside the service providers network. For multiple sites, each router would need a single access link to the ATM network, with a VC between sites as needed. ATM can use use permanent VCs (PVCs) like Frame Relay. In fact, the basic concepts between Frame Relay and ATM are identical. Of course, there are differences between Frame Relay and ATM—otherwise, you wouldn't need both! First, ATM relies on SONET for Layer 1 features instead of the traditional twisted-pair specifications such as T1 and DS0. The other big difference is that ATM does not forward frames—it forwards cells. Just like packets and frames refer to a string of bits that are sent over some network, cells are a string of bits sent over a network. Packets and frames can vary in size, but ATM cells are always a fixed 53-bytes in length. ATM cells contain 48 bytes of payload and a 5-byte header. The header contains two fields that together act like the DLCI for Frame Relay by identifying each VC. The two fields are named Virtual Path Identifier (VPI) and Virtual Channel Identifier (VCI). Just like Frame Relay switches forward frames based on the DLCI, devices called ATM switches, resident in the service provider network, forward cells based on the VPI/VCI pair. The users of a network typically connect using Ethernet, and Ethernet devices do not create cells. So, how do you get traffic off an Ethernet onto an ATM network? When a router receives a packet and decides to forward the packet over the ATM network, the router creates the cells. The creation process involves breaking up a data link layer frame into 48-byte-long segments. Each segment is placed in a cell along with the 5-byte header. Figure 4-11 shows the general idea, as performed on R2. As you will read more about in Chapter 5, "Fundamentals of IP," routers forward IP packets, but they must add a data-link header and trailer to the packet before sending it. R2 takes the packet, adds a data-link header appropriate for ATM, and then also segments the frame into cells before sending any data. R2 takes the first 48 bytes of the frame and puts them in the payload field of a new cell. Next, it takes the next 48 bytes and puts them in another cell, and so on. The cell header includes the correct VPI/VCI pair so that the ATM switches in the ATM network know to forward the cells to R1. R1 actually reverses the segmenation process after receiving all the cells—a process called reassembly. The entire concept of segmenting a frame into cells, and reassmebling them, is called segmentation and reassembly (SAR). Cisco routers use specicalized ATM interfaces to support ATM. The ATM cards include special hardware to perform the SAR function quickly. They also often include specical hardware to support SONET. Because of its similar function to Frame Relay, ATM also is considered to be a type of packet-switching service. However, because it uses fixed-length cells, it more often is called a cell-switching service.